A few smaller developers are in talks with providers of shared working space as they seek to monetize underutilized commercial assets. Shared working space, a concept popular among start-ups and entrepreneurs in the West, is starting to find takers in India. A handful of smaller developers have initiated talks with providers of shared working space as they seek to capture the trend and monetize underutilized commercial assets. 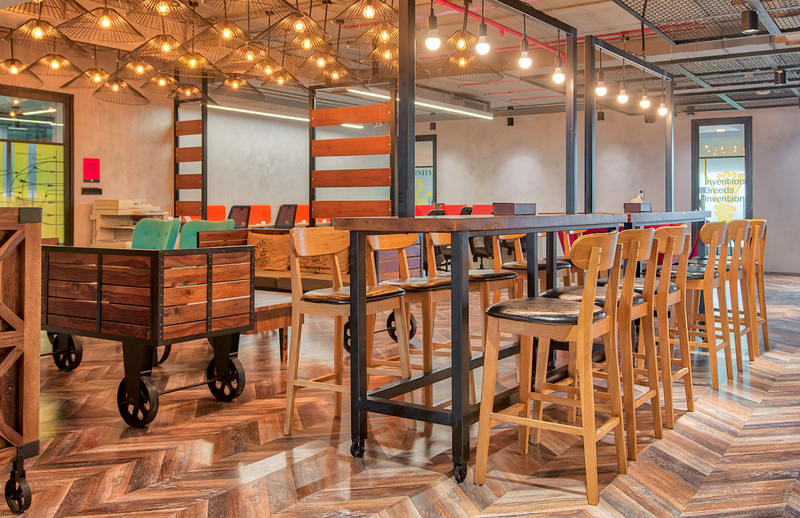 US-based office rental firm WeWork, which announced plans to enter India on 15 January, is in talks with developers including Bengaluru-based RMZ Ltd and Embassy Group, Mumbai-based Wadhwa Group and K Raheja Corp., according to people involved in the discussion. The Wadhwa Group, which operates high-end commercial office buildings in Mumbai’s Bandra Kurla Complex (BKC), confirmed that it is in discussion with the New-York based firm. “It is at discussion stage right now,” said Navin Makhija, managing director, Wadhwa Group, refusing to divulge further details on talks with WeWork. Spokespersons for RMZ Ltd and K Raheja Corp. declined to comment. “We have no comments, confirmations or announcements at this point,” said a spokesperson for Embassy Group in an email response. Similarly, a spokesperson for WeWork said, “We have nothing to share at this time but we’ll be in touch if this changes,” in response to an email query sent on 14 January 2016. Some deals for shared office spaces have already been closed. 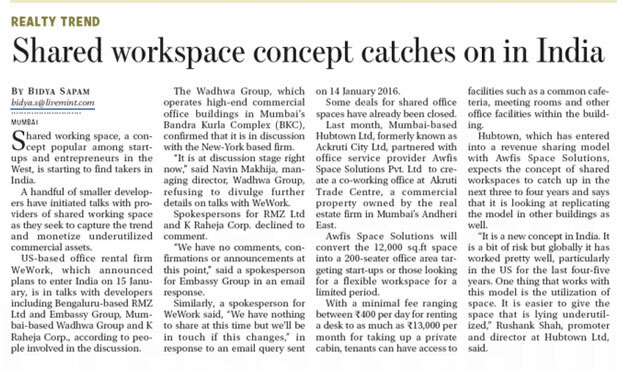 Last month, Mumbai-based Hubtown Ltd, formerly known as Ackruti City Ltd, partnered with office service provider Awfis Space Solutions Pvt. Ltd to create a co-working office at Akruti Trade Centre, a commercial property owned by the real estate firm in Mumbai’s Andheri East. 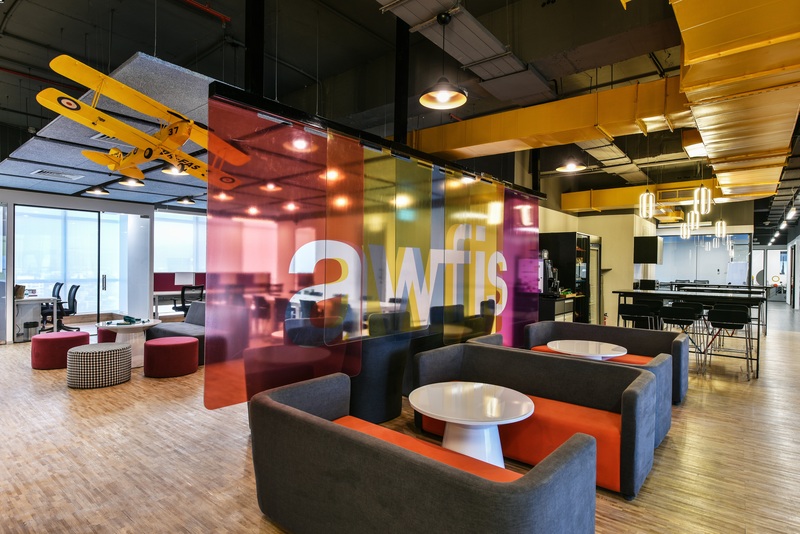 Awfis Space Solutions will convert the 12,000 sq.ft space into a 200-seater office area targeting start-ups or those looking for a flexible workspace for a limited period. With a minimal fee ranging between Rs.400 per day for renting a desk to as much as Rs.13,000 per month for taking up a private cabin, tenants can have access to facilities such as a common cafeteria, meeting rooms and other office facilities within the building. Hubtown, which has entered into a revenue sharing model with Awfis Space Solutions, expects the concept of shared workspaces to catch up in the next three to four years and says that it is looking at replicating the model in other buildings as well. “It is a new concept in India. It is a bit of risk but globally it has worked pretty well, particularly in the US for the last four-five years. One thing that works with this model is the utilization of space. It is easier to give the space that is lying underutilized,” Rushank Shah, promoter and director at Hubtown Ltd, said. Awfis Space Solutions has also leased around 10,000 sq.ft of space from Poddar Developers in central Mumbai’s Lower Parel area, where it is currently operating a 230-seat co-working office. Around 30% of the total seats have been occupied in a span of less than two months since it began operational in December last year, said Amit Ramani, co-founder, Awfis Space Solutions. “Historically, the idea of shared workspaces was more about a providing short-term solution by developers for their long-term clients. They would rent out a small area, provide them an incubation space for a few months or a year till the building is ready. Now they (real estate firms) want to run this as a business,” said Ram Chandnani, managing director (transactions), CBRE South Asia Pvt. Ltd, a real estate consultant. The concept, however, will work better in some markets and areas than others. Wadhwa’s Makhija said the concept of shared workspaces will find more takers in tier II and tier III office buildings where the rentals are relatively low. It will be a challenge to popularise such a concept in high-end buildings. Ramani agrees that grade A office spaces are not suitable for shared office spaces.